Flasks used by the nuclear industry to carry deadly radioactive material around the country could explode, causing nuclear disaster. Research by French scientists found that the flasks were only able to resist fire for less than three minutes. The flasks transport uranium hexafluoride, or "hex"- used to make fuel for nuclear power stations. 8 SPRINGFIELDS KNOWN CONTRACTS 9 DANGER OF CRITICALITY? CONCLUSION - DUCKS BEING LINED UP FOR MORE NUCLEAR FUELLED MADNESS? Springfields is the world’s first nuclear fuel production installation (grid reference SD468315) based at the end of Preston New Road, in Salwick, near Preston, Lancashire, England. Springfields started out as a Royal Ordnance Factory in 1940 producing chemical weapons despite the UK signing up to the Geneva Convention in 1925 banning the use of those weapons. (PDF Ministry of Supply – Springfields https://rhydymwynvalleyhistory.co.uk/documents/Springfields.pdf) Springfields was rapidly decommissioned after the WW2 production of mustard gas. 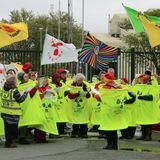 The site was cleaned up and handed over to the nascent Atomic Energy Authority to prepare uranium ore and to chemically separate out plutonium from the waste produced by the Windscale reactors (Windscale is now known as Sellafield, there are now no operating reactors). This plutonium was used to make atomic bombs. Springfields was the first nuclear plant in the world to produce fuel for an industrial-scale plutonium-producing nuclear power station (Calder Hall, 1956, adjacent to Windscale/Sellafield). Now, nuclear fuel and materials are sent worldwide from Springfields, including to Russia. The fuel for all the UKs reactors is made at Springfields who are being encouraged by government to prepare for producing even more dangerous “high burn” fuel for new nuclear builds at: Sellafield, Wylfa, Sizewell, Bradwell, Oldbury, Hartlepool and Heysham. Our European neighbours, who have banned new nuclear and are adopting nuclear phase out, look upon the UK Government’s nuclear new build policy in disbelief. Springfields is key to the UK’s dangerous new nuclear build policy. 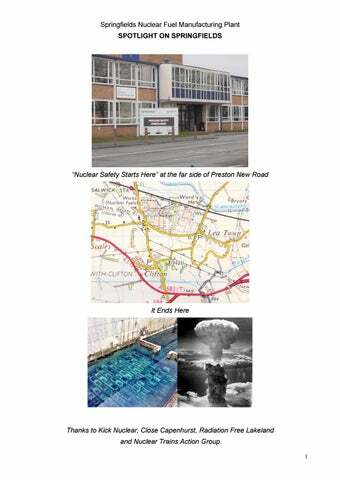 Springfields has, however, operated for many decades under a veil of secrecy with little public scrutiny or outrage at the nuclear nightmare being birthed at the end of Preston New Road. WHAT SPRINGFIELDS DOES: 1. Production of oxide fuels for advanced gas-cooled and light water reactors, as well as intermediate fuel products (uranium dioxide powders, granules, and pellets). 2. Production of uranium hexafluoride, or "hex" from uranium ore concentrates. This 'hex' is sent to Capenhurst, where it is enriched, and then sent back to Springfields for reconversion into UO2 and manufacture of fuel rods. (Note: Capenhurst in Cheshire was a BNFL site which originally housed a diffusion plant that ceased operating in 1982. The diffusion plant enriches the Uranium 235 from .7% occurring naturally to the 3.5% to 4.5% needed for reactor fuel. The site now focuses on the decommissioning and storage of uranic materials. Capenhurst is also home to the first commercial scale centrifuge plant for the enrichment of uranium. Capenhurst is owned by Urenco. The British Treasury is a one-third owner of Urenco Ltd. (During May 2015 May the UK ownership of URENCO was moved from the Shareholder Executive to the UK treasury.) The Dutch government owns a third and the German electricity companies EON and RWE own the final third. See http://close-capenhurst.org.uk/). 3. Processing of fuel-cycle residues (i.e. after the fuel has been irradiated in reactors) 4. Decommissioning and demolition of redundant plants and buildings. Use of HT - IDR (High Throughput - Integrated Dry Route) for UF6 reconversion to UO2. Enriched Uranium Hexafluoride arrives at Springfields and is converted to uranium dioxide (UO2) powder in a kiln using process called the 'Integrated Dry Route' (IDR). Decommissioning process plants starts with the removal of the majority of activity contained within the plant. This is known as Post Operational Clean Out. Once this is complete the plant may be dismantled. Waste from both these phases will be disposed of to disposal sites such as Drigg or Sellafield. Springfields decommissioning and clean-up operations started in 1990 with the post operational clean-out of the old UKAEA Springfields Nuclear Fuels Laboratories. Since this time the site has undergone an intensive decommissioning programme. 87 buildings on the site have been demolished. DECOMMISSIONING BNFL SPRINGFIELDS BUILDING B62 "Customer: BNFL, 2017. Value: ÂŁ0.6 million. This project involved the decontamination, demolition and site remediation of Building B62 for British Nuclear Fuels Limited, located within a live nuclear fuel processing plant at Springfields near Preston. Various previous processes had left a cocktail of contamination, including uranium oxide, chemical residues from the production of tear gas and mustard gas, together with asbestos sheeting and lagging." Deepdale Brook flows through the Springfields site, which flows into Savick Brook, which flows into the River Ribble. The British Geological Survey performed a pilot study on the isotopic composition of uranium found in stream sediments near nuclear fuel facilities in the United Kingdom. Samples were collected between 1979 and 1989 downstream from the following facilities: • Drigg, Cumbria (part of the Sellafield complex), • BNFL Springfields facility, near Preston (conversion and fuel fabrication), • URENCO Capenhurst uranium processing complex (enrichment) Uranium concentrations found in Drigg and Springfields stream sediments were about 20 times background, while those in Capenhurst were up to about 3 times background. Uranium anomalies identified using G-BASE data - Natural or anthropogenic? A uranium isotope pilot study, by SRN Chenery, EL Ander, KM Perkins, B Smith; British Geological Survey, Internal Report IR/02/001, 34 p., Keyworth, Nottingham 2002 U-238/U-235 isotope ratios observed in stream sediments at Drigg and Springfields were in a 114.0 - 125.4 range (corresponding to 0.79 - 0.86 wt_% U-235), while those observed in Capenhurst were in a 54.8 - 63.0 range (corresponding to 1.55 1.77 wt_% U-235). For comparison: the U-238/U-235 Ratio for natural uranium is 137.9, corresponding to 0.72 atom-percent, or 0.711 weight-percent U-235. CONCLUSION DUCKS BEING LINED UP FOR MORE NUCLEAR FUELLED MADNESS? In January 2018 Lancaster Business View reported: José Emeterio Gutiérrez, president and CEO of Westinghouse, said: “Brookfield’s acquisition of Westinghouse reaffirms our position as the leader of the global nuclear industry. Our transformation and strategic restructuring process is creating a stronger, stable, and more streamlined global Westinghouse business, for the benefit of our customers and employees.” The acquisition is “expected to close in the third quarter of 2018, subject to Bankruptcy Court approval and customary closing conditions including, among others, regulatory approvals.” The nuclear industry … too many vested interests within the nuclear civil military complex to fail? More info: VIDEOS 1. Movietone report, 1950's. One minute long. https://www.youtube.com/watch?v=4zJ78LUupAs 2. Manufacture of rods. 2 min 12 sec. No sound. Similar to 1. https://www.youtube.com/watch?v=O1W4EVQQWSY 3. Dumping from Springfields, Sellafield. 53 minutes. https://www.youtube.com/watch?v=9auzctxGuck 4. Inside Sellafield 1989 63 mins. https://www.youtube.com/watch?v=A6mpz7FcCTU 5. Windscale - The Nuclear Laundry 1983 60 mins. https://www.youtube.com/watch?v=gidQewCtTqY 6. http://www.gettyimages.co.uk/detail/video/uranium-238-being-handled-and-machinedinto-rods-stock-video-footage/mr_00058314 42 seconds.